A Council by-election will be held in Manchester’s Rusholme ward on Thursday 4 May 2017. It follows Councillor Kate Chappell, one of the ward’s three current elected members on Manchester City Council, stepping down. The very popular night markets have been special occasions before. From today they go monthly replacing the Saturday market once a month moving to every third Friday of the month. Food and fun from 17.00-21.00. Leader of the Liberal Democrats, Tim Farron MP, visited Levenshulme today. 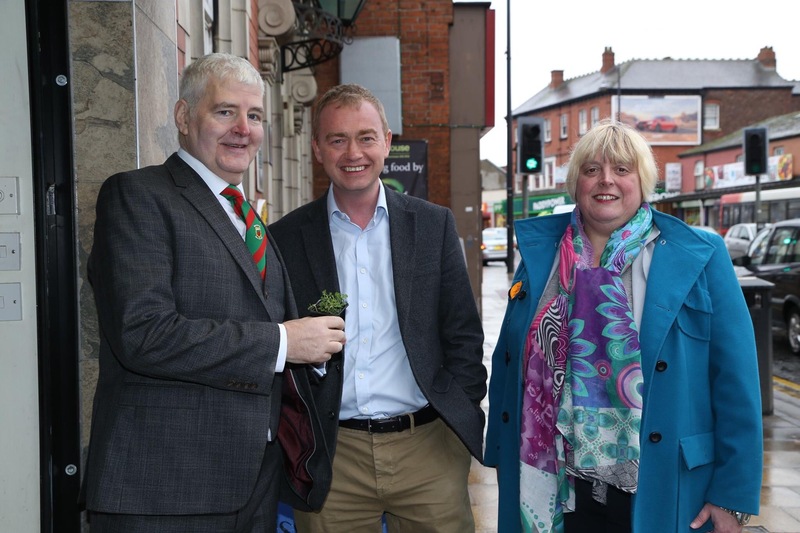 He is pictured here with Lawrence Hennigan, Levenshulme Community Association Core Group member and Chair of Levenshulme Traders’ Association alongside Jackie Pearcey, Libdem parliamentary candidate for the Manchester Gorton constituency. NOTE: The LCA does not endorse any political party or candidate. Roll up! Roll up! 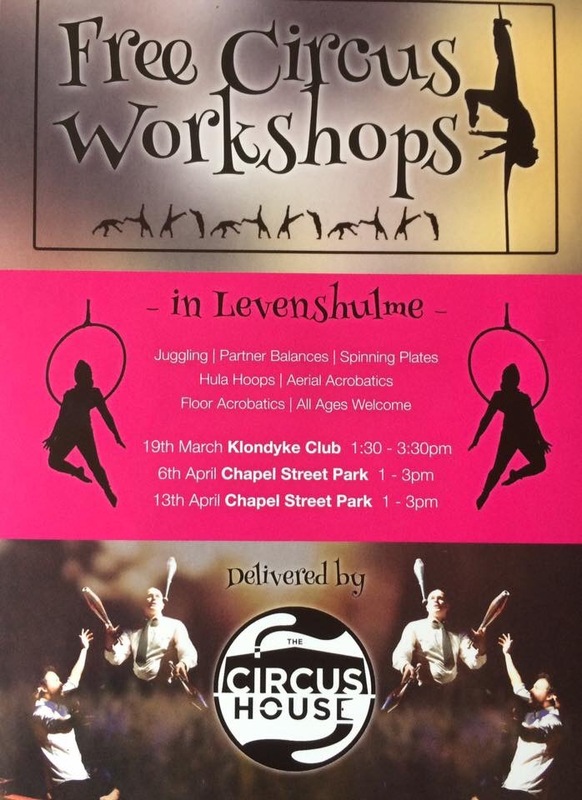 Fantastic free circus workshops in Levenshulme provided by The Circus House. Juggling / partner balances / spinning plates / hula hoops / arial acrobatics / floor acrobatics. With just over 2 weeks to go, I hope you have this fantastic event in your diaries? 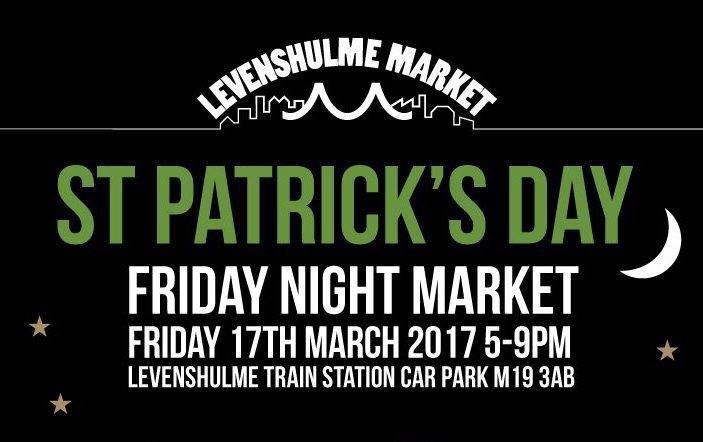 Come and bag yourself some bargains whilst taking a lovely stroll around Levenshulme! 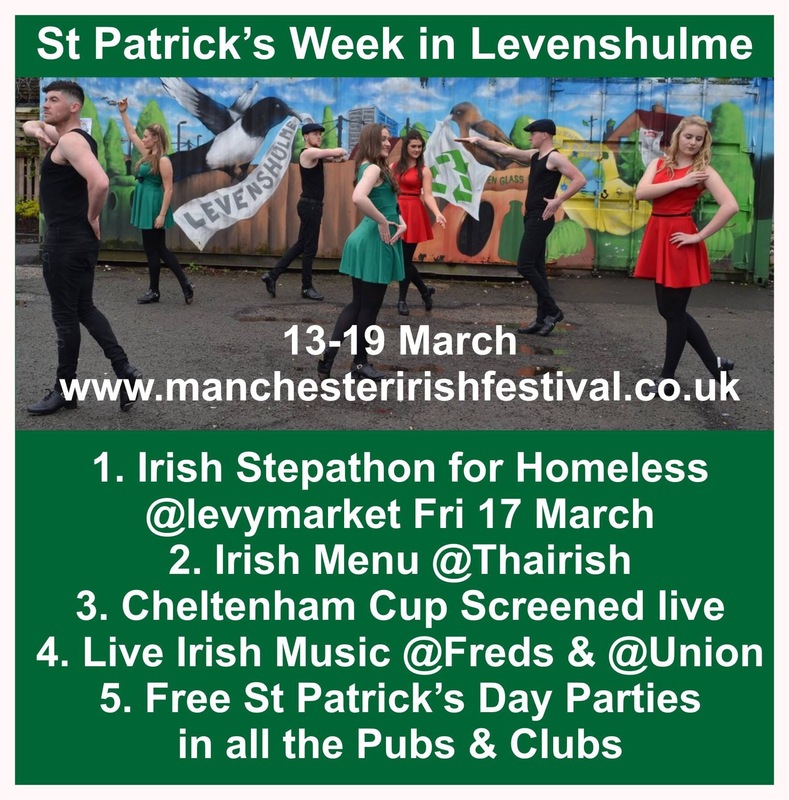 Happy St Patrick’s Week from Levenshulme. There’s lots going on. See www.manchesteririshfestival.co.uk for full details. The next meeting of Frinds of Levenshulme Station is Wednesday (15 March) at the Inspire cafe from 6.30pm till 7.30pm. All welcome! Please note this is a change from our usual Community Room in Arcadia Leisure Centre. It’s a one-off meeting at Inspire due to a double booking of the Arcadia community room. Judy Noah, Head of Development at One Manchester will be at the Levenshulme Community Assoiciation AGM this afternoon to provide information and answer questions on the Chapel Street housing development. The meeting starts at 14.30, Saturday 11th March, in the Community Studio in the Arcadia Library and Leisure Centre. Meet at Bickerdike Avenue entrance. The next meeting of the Friends of Fallowfield Loop will be on Monday 20th March at the Union chapel Wellington Road Fallowfield at 7.30pm. New members welcome.Subsequent meetings will be held bi-monthly on the 3rd Monday of odd months. 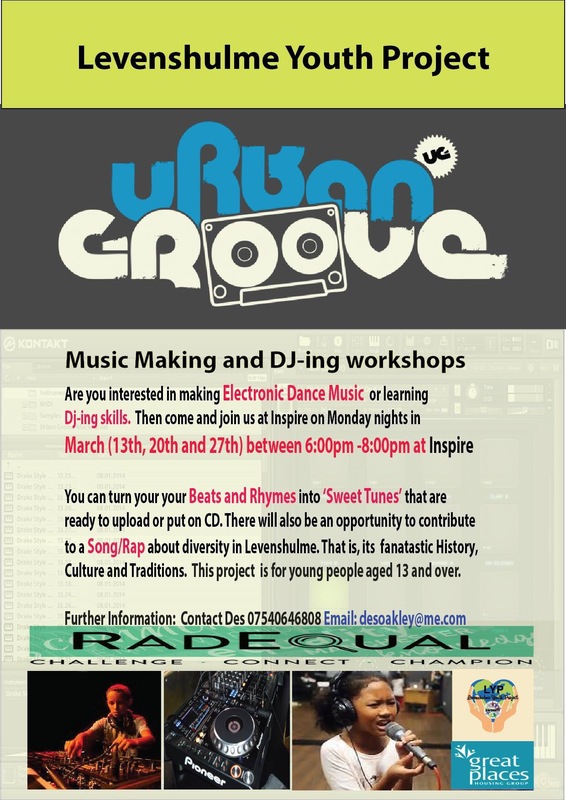 Levenshulme Youth Project is running music making and DJ-ing workshops at Inspire on Monday 13th, 20th and 27th March, 18.00-20.00.